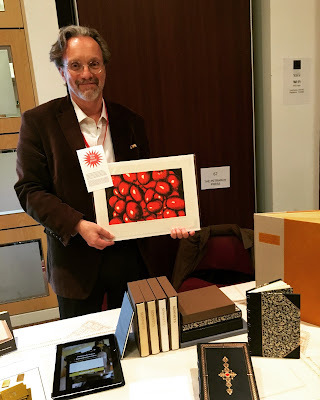 Solmentes Press is delighted to announce the winner of the prize draw at the Oxford Fine Press Book Fair was fellow printer William Bentley from Califorina. Congratulations William! William won a signed copy of the limited edition linocut"Heirloom Tomatoes" by David Esslemont from Pizza from Scratch. The winner of the Prize Draw at the Manhattan Fine Press Book Fair on March 10 was John Snyder from Philadelphia. Congratulations John! To win a copy of the signed original print “Heirloom Tomatoes” a hand-colored linocut by David Esslemont from Pizza from Scratch, visitors to the Solmentes Press table at the book fairs put their business card or name and email address in a box from which a winner was drawn at the end of the fairs. Copies of the print can be purchased for $200 (£148) at solmentes.com.